Let me explain how this simple statement took me from zero to rage dump. Inherent in this comment is the belief that Christians in America are facing persecution from gays and abortionists. Being steeped in evangelical culture, I hear this sentiment expressed all the time. CEO of Mozilla resigns due to protests over his support of Prop 8? 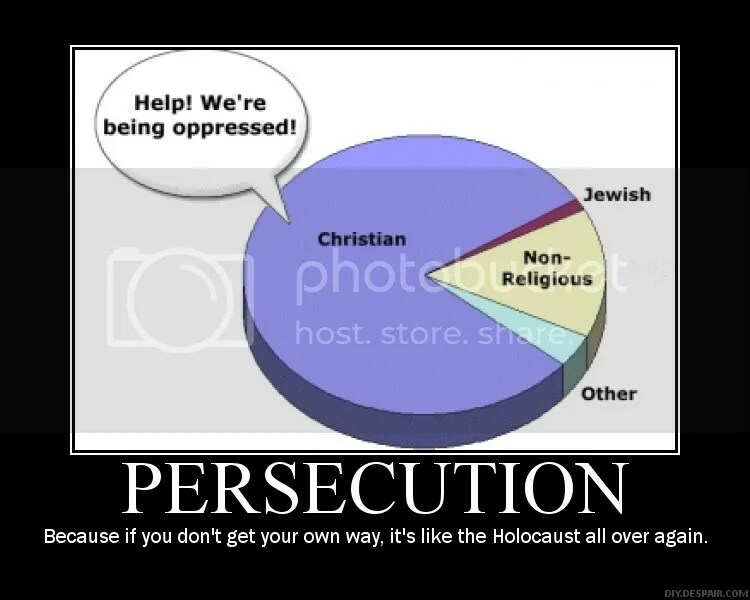 Persecution! Reality TV shows starring Christians get canceled when said Christians make anti-gay remarks? Persecution! Christian teens are told to stop bullying their LGBT classmates? Persecution! – In six Indian states, believers must obtain government permission to convert from Hinduism to Christianity, which requires a one-month waiting period. If someone chooses to convert without permission, he or she can be jailed and even executed. Roving Hindu gangs have been known to drag Christian pastors from their beds and behead them in the middle of the night. In other parts of India, Christians have lost all government benefits, including retirement and disability pensions, schooling for their children, and even their right to be recognized as citizens of their home communities. – Up until 2012, Christians in Egypt could not maintain their churches in any way – not even a coat of paint – without the Egyptian president’s permission. As a result, most churches in Egypt are over 100 years old and in dangerous states of disrepair. Believers themselves face daily threats of violence and death from Muslim extremists. Just wearing a cross around your neck can be a death sentence. – In Iraq right now, the terrorist group known as ISIS is forcing Christians to study the Quran in an attempt to re-convert them. Those who refuse are beheaded. Including children. – In some Eastern European countries, believers are forbidden to gather for worship anywhere except in a state-approved church building, and all religious groups must be registered with the government. Government won’t recognize your group as legit or let you build a church? Tough. That one came from a church in Latin America. Real persecution involves systematic harassment and discrimination to the point that practicing one’s religion becomes incredibly inconvenient or deadly. Being asked to refrain from discriminating against others isn’t persecution. I believe that if you can get up on a Sunday morning and put on a Christian t-shirt, climb into your car with Christian bumper stickers on it, drive to the nearest mega-church on the corner with an 80-ft. cross on the lawn, worship for two hours without anyone interrupting, then go stand on the steps of the nation’s capitol building (where your views have majority representation) waving a placard and yelling into a megaphone about Christian values and actually have your words taken seriously, then I DON’T THINK YOU KNOW THE MEANING OF THE WORD. None of us really do. I think what we’re actually seeing in regards to the gay community is a matter of consequence – as in, we created the situation in which people who express disapproval of homosexuality lose their platform and, in some cases, their livelihoods. Gay people didn’t just decide willy-nilly one day to start opposing Christians. Evangelicals started it when we decided we should follow the old-covenant Levitical practice of putting homosexuals to death. When that didn’t fly, we tried to get gays imprisoned. We locked them out of our churches. We classified their orientation as an illness. We lobbied for the repeal of anti-discrimination laws. We stood by and said, “Serves you right” when they suffered violence at the hands of others. Those who came out on the job, we fired. Those who were already out, we refused to hire. We turned gay children out of our homes. We went into Uganda and encouraged the religious leaders there to support a bill that, if passed, would allow the government to imprison and execute gays. A few months ago, evangelicals told the gay community that we’d rather let children in Africa starve than let any of them serve at a Christian charity. When Ellen DeGeneres was hired as a spokesperson for JCPenney, evangelical groups tried to get her fired – simply for being an openly gay woman. FYI: She was modeling clothes, not teaching Sunday school. It’s no wonder the gay community has decided to push back. Our ‘deeply held religious beliefs’ may be at stake for some of us, but for them, it’s their lives. It’s their ability to work. It’s their ability to provide for their families. It’s their ability to live in peace and freedom. It’s their ability to live. So no wonder they don’t want anyone on TV spewing anti-gay rhetoric. No wonder they don’t want politicians in power who will oppose civil rights legislation. History has shown them just how bad oppression can get. In more than half the states of the union, it’s still possible to be fired just for being gay. The hard truth is, we ignored the commands of Jesus to “love your neighbor as yourself” and “do unto others as you would have them do to you.” We thought that standing up to ‘sin’ was more important than showing the love of Christ. I thought that, once. Some still think it. And this is what God is allowing evangelicals to have: our just comeuppance. Funny how it’s persecution when they do it, but not when we do it. The question is, why do American evangelicals engineer their own ‘persecution’? Well, I have a theory about that. See, when someone is truly living as Christ commanded us to live, persecution is a given. Jesus said so. As one blogger I read recently put it, “sin cannot tolerate the presence of God.” Someone who is truly living as holy – loving their neighbor, defending the cause of the oppressed, etc. – will eventually face opposition. The problem is, it’s really hard to live up to Christ’s standard. So we’ve manufactured a sort of quasi-Christianity that almost looks like the real thing and doesn’t make us too uncomfortable. After all, it would be terribly inconvenient if the police showed up at our next church service and started dragging people off to jail for worshiping the Lord. But how to get enough persecution to ‘prove’ that we’re true followers of Jesus? This. Oppressing minorities and crying foul when they fight back. Except the only people we’ve fooled is ourselves. The rest of the world sees straight through the charade. And they’ve had enough. So how do we turn it around? How do we change the situation? I can think of only one thing. Repent! This entry was posted in Social Issues, Uncategorized and tagged Christian politics, Christianity, culture, equality, evangelicalism, fundamentalism, homosexuality, love, persecution. Bookmark the permalink. Thanks for writing this. I think this is a great perspective on “persecution” faced by Christians in America, and it is exactly the reaction I have when I hear about a nativity scene that got shut down or “under God” being eliminated from the pledge of allegiance. I think there’s a place for using our constitutional rights, as Christians who are citizens of a wealthy first world democracy, to freely exercise our religion and speak freely, but we need to have some perspective, and for the most part, we should speak from a position of enormous gratitude that we don’t and are not likely to ever to face the real persecution experienced by most Christians throughout most of the world throughout most of Christian history.